St Johnstone hope to call upon the services of injured defender Steven Anderson over the festive period. 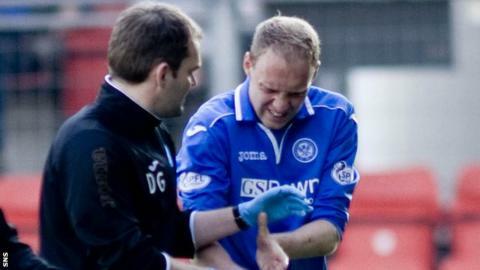 Anderson, 27, dislocated his thumb during a 1-1 draw at home to Partick Thistle in September. "Steven could possibly train full contact next week, which is maybe two or three weeks earlier than we thought," said manager Tommy Wright. "There's every chance he'll be involved for the festive period; we'd ruled him out until the first week in January." Saints face Hibernian, Celtic, Dundee United, Motherwell and Ross County within 15 days over Christmas and New Year. Wright added: "Ideally we would like to get him part of a 20s game next week. There are only two 20s games (before Christmas) so if we could get him two games that will help his progress."